Several hosting providers no longer allow websites to send e-mails anonymously using built-in functionality. In that case configuring SMTP is required for contact forms and other e-mail features to work. We assume you have already logged in to Sitemagic CMS. Browse to Admin > Settings and find the SMTP Server section. You may have to expand it using the highlighted expand/collapse button. 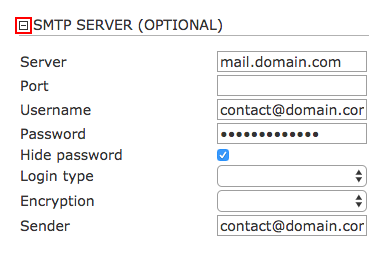 Enter the relevant SMTP configuration and click the Save button on the page. The SMTP information required will differ depending on your hosting provider, so send them an e-mail with a link to this page and ask them for the relevant details.